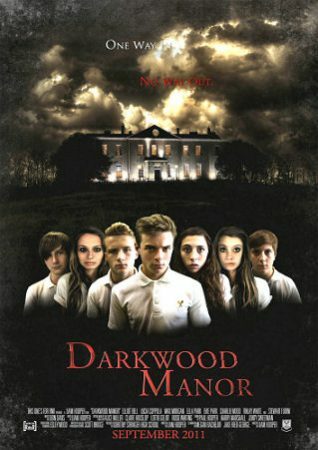 The UK premiere of Darkwood Manor, the first feature length horror movie from 17 year old Brighton based film maker Liam Hooper, takes place on 10th September 2011 at the Duke of York’s Picture House, Brighton. Darkwood Manor started life as a Year 8 scheme of work and as such the title will be familiar to drama students up and down the country. For one student however, the project became something more and, having been involved in film throughout his school career, Liam Hooper couldn’t resist the challenge set by one of his tutors to make one final film before leaving school. Working with students, staff, friends and family it took Hooper a total of three years and the best part of £1000 (of his own money) to script, film and edit the 1 hour 20 minute film. The opening scenes centre on a group of students from Dorothy Stringer High School who have just learned that their school is to close unless £50,000 can be found to save it. When one of the students finds a flyer on the street offering a reward to anyone who can spend two nights caretaking the supposedly haunted Darkwood Manor, it seems that their troubles are over. But when the intrepid group of volunteers and their form tutor arrive at the Manor it quickly becomes clear that the resident evil is not a ghost after all and one by one they start to disappear. “I took my inspiration from Scream which I consider to be one of the most inspirational horror films to emerge from contemporary cinema”, says Hooper. Brighton’s historic Stanmer House acts as the location for the fictional Darkwood Manor. Steeped in history, the restored eighteenth century mansion was the perfect setting for the film. Hooper adds: “I was incredibly lucky to be given permission to film at Stanmer House which provided this fantastic balance of old world grandeur combined with a classically chilling horror movie atmosphere”.